BANGI, 18 Mar 2014 – Modern medicine and traditional healing can work together to find cures for some illnesses. President of the Malaysian Natural Products Society Professor Dr. Ibrahim Jantan said doctors and traditional healers can carry out research on the use of natural products and herbs to produce new pharmaceuticals. Speaking at the launching of the two-day International Conference on Natural Products (ICNP) 2014 here today, Prof Ibrahim, who is the conference chairman, said there were many opportunities for researches of the various fields to interact, collaborate and form a network for the discovery and development of herbal medicine. ICNP is a meeting of local and international researchers who can help to reduce the gap between the old folk remedies and modern medicine through the collaboration of the scientific minds. 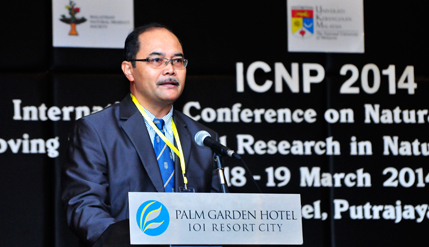 The ICNP is an annual activity of the Malaysian Natural Products Society (MNPS). This year, its 30th on the theme Moving Translational Research in Natural Products Forward is organised by the Centre for Drug and Herbal Research, Faculty of Pharmacy of The National University of Malaysia (UKM). It provides a platform for academicians, scientists, researchers and postgraduate students to interact and cooperate in the field of natural products. Prof Ibrahim said for most Asians, herbal medicine plants are essential products in many fields but their preparations still had not extended to the desired levels of quality, safety and efficacy as only some had been discovered and commercialised to form new drugs. The conference was launched by Agriculture and Agro-Based Industry Minister, Dato’ Sri Ismail Sabri Yaakob. Deputy Vice Chancellor (Academic and International Affairs), Prof Ir Dr Riza Atiq Abdullah O.K. Rahmat also attended the conference.